The ONE Campaign faced a challenge familiar to many organisations – it needed to make a complicated campaign message relatable, engaging and highly shareable. There was the cause: ONE’s campaign for 130 million girls around the world to get access to education. There was a moment: International Day of the Girl. And ONE had a wealth of shocking statistics. To do this, we worked with ONE’s digital team to create 9countries.one.org, an engaging quiz designed to take encourage participants to sign a petition. We began by drilling down into ONE’s bank of statistics about girls’ education to see if we could hone in on a single fact that would resonate with a wide range of people. One jumped out; in Guinea, girls spend as little as seven months in school during their lifetime. This became the stat to shape the campaign messaging. Next, we needed a hook. We knew from previous projects that content which speaks to a user’s identity is particularly shareable. We decided to tap into people’s geographical knowledge. Like being bad at maths, knowledge of geography (good or bad!) is an important part of how people perceive themselves. We all know the friend who struggles to find their way back from the shops at lunch, and the mate who can proudly name every single capital city. We settled on a simple concept: the “9 Countries Quiz”. 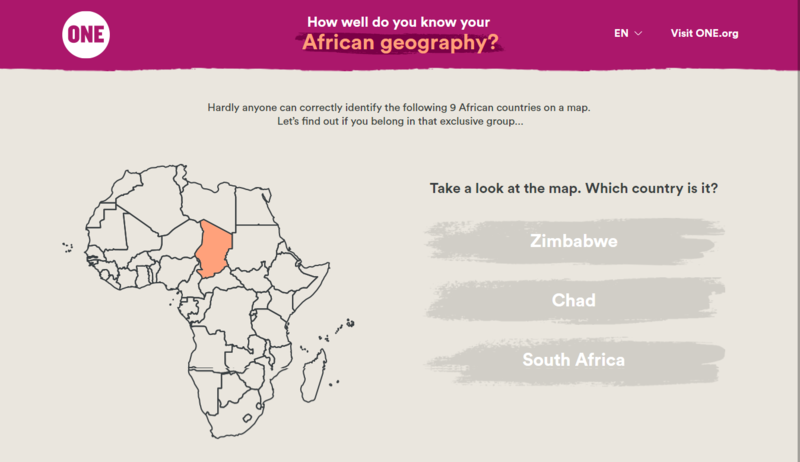 The quiz challenged users to test their geography knowledge by trying to name nine African countries highlighted on a map. While waiting for their results, we told users these are nine of the toughest countries for a girl to get an education – and asked them to sign a petition demanding more education funding. Aside from the geography framing, there were three other key considerations that went into the execution. First, we framed the quiz as a challenge: “Hardly anyone can name all these countries – can you?” This motivated people to complete the quiz, and encouraged competition (and organic sharing!) between friends. Second, we focused on creating an engaging user experience: the site flowed, design was stripped back, and the copy was short and easy to read. This meant people stayed with us and completed the action, got to the campaign’s core message, and put their name to the petition. Finally, we made signing the petition optional – users didn’t have to sign up to see their results. We didn’t want to inhibit people from sharing the quiz, and we wanted to inspire genuine support for the campaign. Our hope was that without a barrier to sharing, we would see more traffic to the site and more petition signatures overall. We were confident in the strategy, but the tool delivered results beyond even our most ambitious predictions. Just a day after the launch a total of 1.8 million people had used the tool, almost all driven to the page by organic user sharing. From them, 375,000 new people signed the petition and joined ONE’s supporter list. To date, the campaign has engaged over 2.6 million people, with half a million new people signing the petition. So: what can we learn from the success of the campaign? How can you too engage the disengaged and expand your reach? Create something people want to engage with. Unpick your messaging. Find a hook which is personally relatable and shareable, ensuring it’s relevant to your campaign’s message. Commit to delivering one objective. This allows the strategic and creative approach to work towards a coherent goal, rather than delivering a compromise strategy that tries – and fails – to hit multiple goals at the same time. ONE came to us with a measurable target (getting new people to sign a petition), and we worked with them to develop a strategy and tool focused on delivering that. Give your team buy-in. We worked closely with a single campaign manager at ONE. This enabled them to give us consistent feedback and prevented the messaging from being diluted or the parameters of the project being stretched. Seek ideas from different perspectives. This concept came from a junior writer at Forward Action. Everyone has good ideas, but teams aren’t always set up to seek them out. Get a wide range of people involved in brainstorming before a smaller group takes responsibility for filtering and choosing the final idea. ONE is now focused on an international education summit in February, and teams around the globe are gearing up to deliver an impressive 650,000 strong petition to leaders. The campaign’s final outcome is still to be realised – but with so much support the impact is already being felt. With over half a million new online advocates, it’s vital ONE continues to engage this new audience with its great work. Ongoing, long-term investment in supporter journeys is vital to ensuring these initial moments of engagement translate into motivated, loyal advocates for your organisation well into the future. Alex is a director and co-founder of Forward Action, a digital agency that works with charities from campaign conception through to results - creating strategies, content and tools to get the job done. Prior to founding Forward Action, Alex launched and headed up the team behind 38 Degrees' "Campaigns by You" petition platform before moving on to work for the Labour Party. He led Labour's email team during the 2015 election campaign.